The Green-and-rufous Kingfisher, Chloroceryle inda, is a resident breeding bird in the lowlands of the American tropics from southeastern Nicaragua south to southern Brazil. 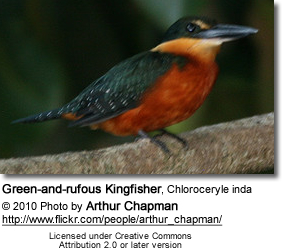 The Green-and-rufous Kingfisher is 24 cm long and weighs 60g. 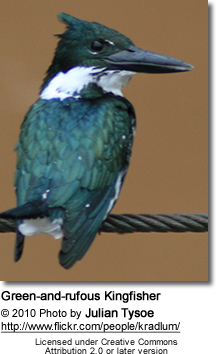 It has the typical kingfisher shape, with a short tail and long bill. The adult male has glossy green upperparts, with white spotting on the wings, and a rufous nape and underparts. The female has a narrow green breast band. Young birds resemble the adult female, but have more spotting on the wings and back. 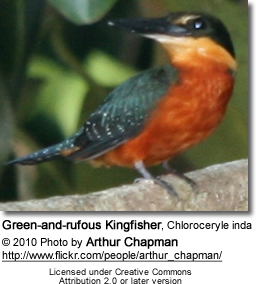 There are no recognised subspecies of Green-and-rufous Kingfisher. The Green-and-rufous Kingfisher resembles the American Pygmy Kingfisher which shares its range, but it is much larger than its relative, and four times as heavy. It lacks the white lower belly shown by the smaller species, and has more white spots on the wings. Besides the Amazon Basin and the Guianas, also Colombia with most of Venezuela, (the Orinoco River basin), a disjunct range of the Green-and-rufous Kingfisher occurs on the southeast Brazil coast. A 200 km wide coastal range extends from central Bahia in the north to Santa Catarina, about 2200 km; a localized coastal population occurs north of Bahia in Pernambuco.